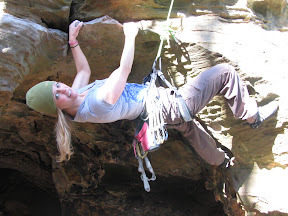 The pictures from this post and my last one really got me thinking about natural versus artificial lighting. Both pictures were taken fairly late in the day as the sunlight was waning, but the light was still strikingly better than anything that my kitchen lighting can produce. I have toyed around with the idea of getting a light box for food pictures, but I don’t exactly want it hanging out in my kitchen. Ideally I could just make dinner before it gets dark, but it is very rare that it actually happens. Maybe it is time to make room for a light box. Does anyone else have one? After prepping squash, combine other ingredients in a sealable plastic bag or other container. 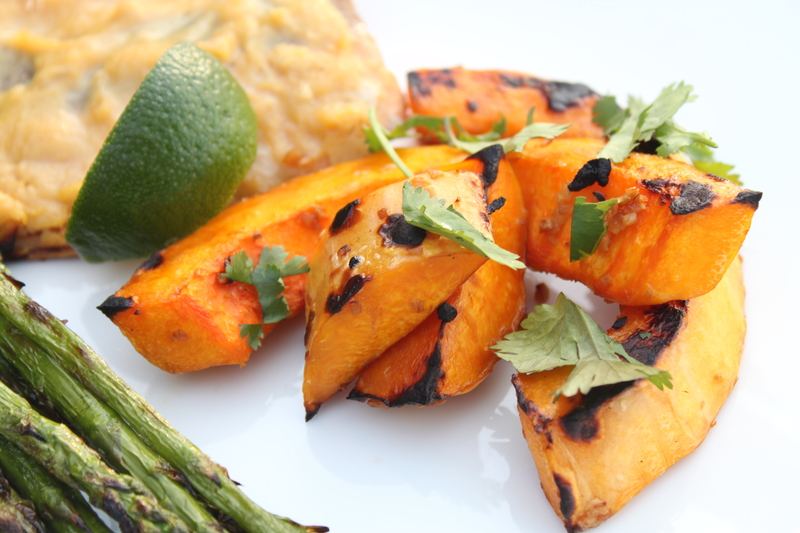 Add squash to sealable container and toss to coat with marinade. Spray grill with olive oil, then grill squash over a medium heat for about 10 minutes, or until tender, turning halfway though. Sunday was yard work day at Duke’s House. Not exactly our favorite weekend activity. Chris spent his afternoon mowing acres and acres of grass while I got to do the fun stuff. I crawled around our flower beds for hours pulling out tons of bulbs and what I think are were chives. We have a war on bulbs at Duke’s House. They have begun to unstake the weed cloth that we so carefully placed in our flower beds last summer. Some exceptionally rebellious bulbs have been growing up through the weed cloth. There are bulbs abound. Even our weed pile, full of remanents from last year’s plant carnage, is sprouting daffodils and what my non-green thumb can best identify as white amaryllis and purple hyacinths. After I decimated hundreds of flower bulbs, Chris used the tractor to dump loads of mulch in strategic locations so that we could spread it more easily and fill in the spots where it had washed away over the winter. Finally, for the first time in the three years that we have lived here, I feel pretty happy with the appearance of our yard. Our long day of yard work was rewarded with a little time vegging on our back porch. This meant an easy grilled dinner, including some of the first asparagus from our garden, prepped by me and cooked by Chris. Combine miso, mirin, rice vinegar, ginger, and sesame oil in a small bowl and whisk together. Heat grill to a medium heat. Place salmon on grill, brush top side with miso glaze, and grill for about 5 minutes. Flip salmon, brush with miso glaze, then continue grill for about 5 more minutes. 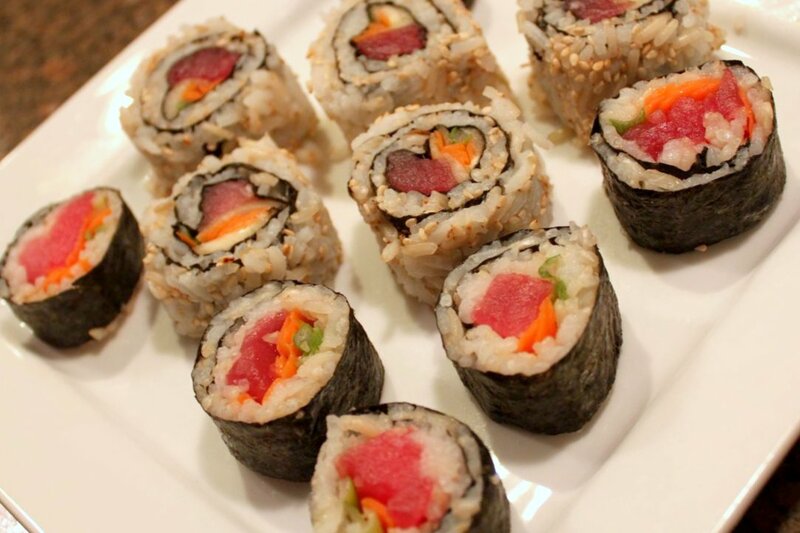 Sushi is one of our favorite foods. Seared Ahi is also. It is pretty much guaranteed that if there is uncooked or barely cooked tuna on a restaurant menu that Chris and I will both order it. Chris and I used to go out for sushi quite often, well, until we developed Duke’s House budget that is. Our “responsible grown up” budget dictated that we needed to eat out less often if we wanted to do other fun things like go to Africa. 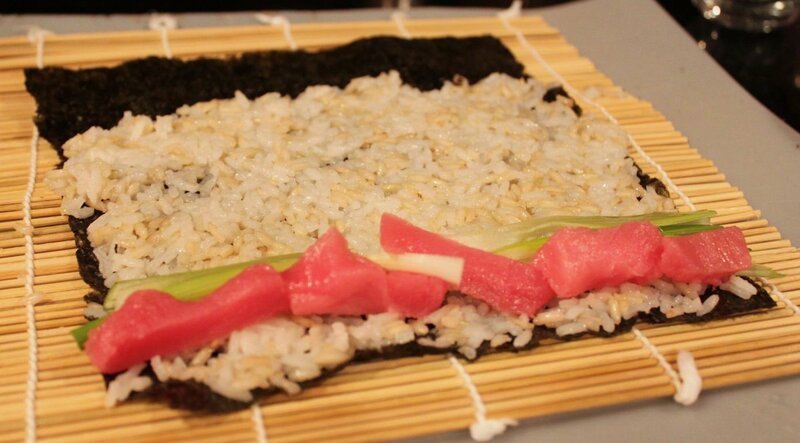 They say that necessity is the mother of invention, and while we didn’t invent homemade sushi, we started making it out of necessity. We like to fill our sushi with tuna, scallions, carrot, and sometimes cucumber, but I think the key here is the rolling technique more than the ingredients because sushi can be made to suit any palate. 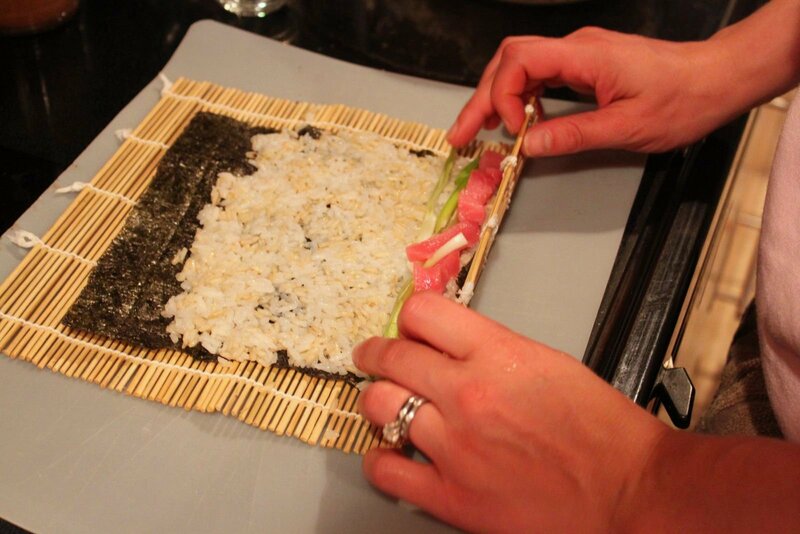 We have even provided the ingredients for “chicken teriyaki” sushi at our sushi parties for non-seafood eating friends. 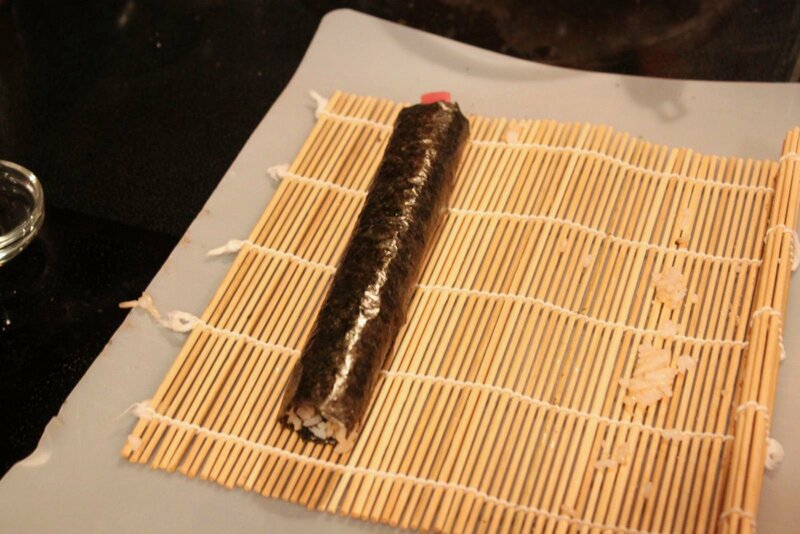 I started making these sushi rolls by placing a sheet of nori on a sushi rolling mat, then spreading a very thin layer of rice on it. Think one grain thick, max. 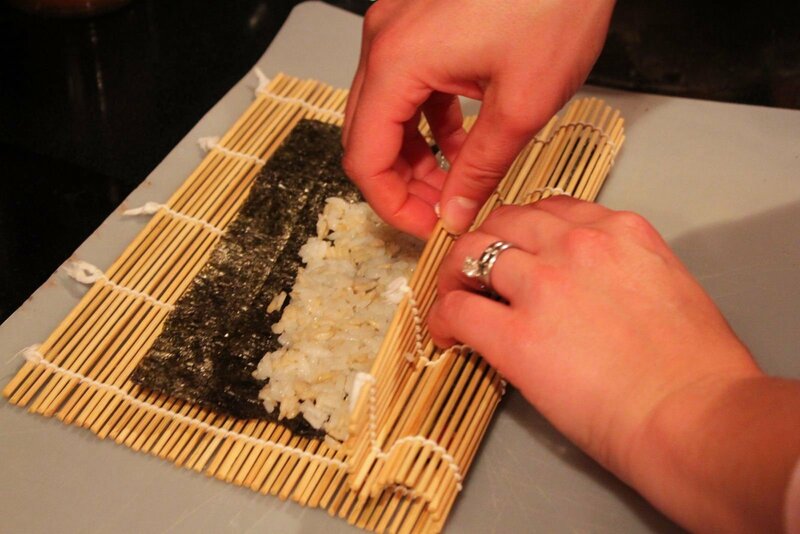 Make sure to leave an inch or two rice-free at the end to seal the roll with. After spreading the rice, I added my sushi fillings. Remember, less is more here! Now for the tricky part. 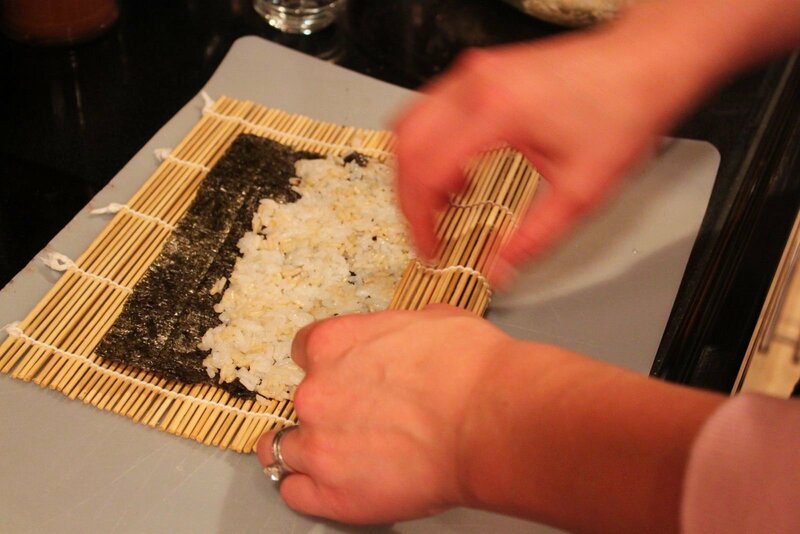 Rolling sushi is kind of like rolling up a sleeping bag. 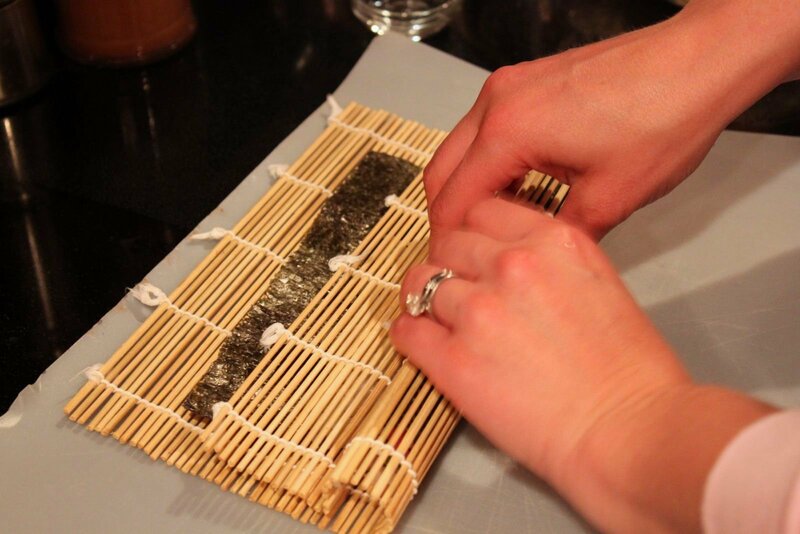 Roll tightly, slip your fingers (and the mat) out, then roll some more until the nori is completely rolled up. 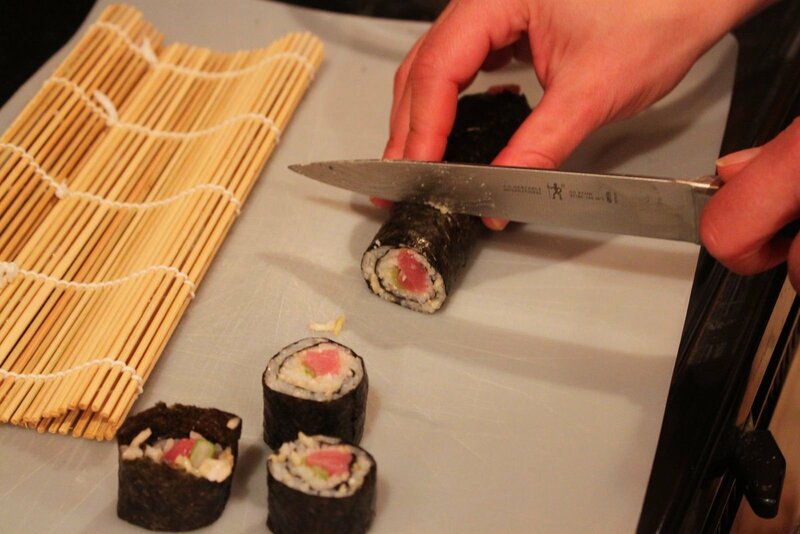 To slice sushi, it works best to use a sawing motion rather than trying to press the knife through. Don’t be afraid to eat the ends of the roll right away! My end pieces always look a bit sloppy, so I prefer to just eat them as I go, especially if I am cooking for guests. 2 cups rice (uncooked) – I used 1 cup brown rice and 1 cup white rice cooked according to my rice cooker’s instructions. 1 package of sushi rice mix – We have this in the Asian section of our local grocery store. Last fall when Chris and I visited Japan, we discovered Okonomiyaki, a Japanese pancake/omelette hybrid topped with Okonomi Sauce and sometimes mayonnaise. We first had it in Hiroshima and then again in Osaka and I could not get enough of it. After being tipped off to a good recipe for Okonomiyaki, found on the back of the Otafuku Okonomi Sauce package, my adventure began. I wanted to go to my local Japanese grocery store to pick up some Okonomiyaki flour and aonori-ko (seaweed flakes) before I made this last night, but we ended up going for a mountain bike ride instead. I ended up using all-purpose flour and skipping the aonori-ko. In retrospect, I could have just tried crumbling some nori into the batter. 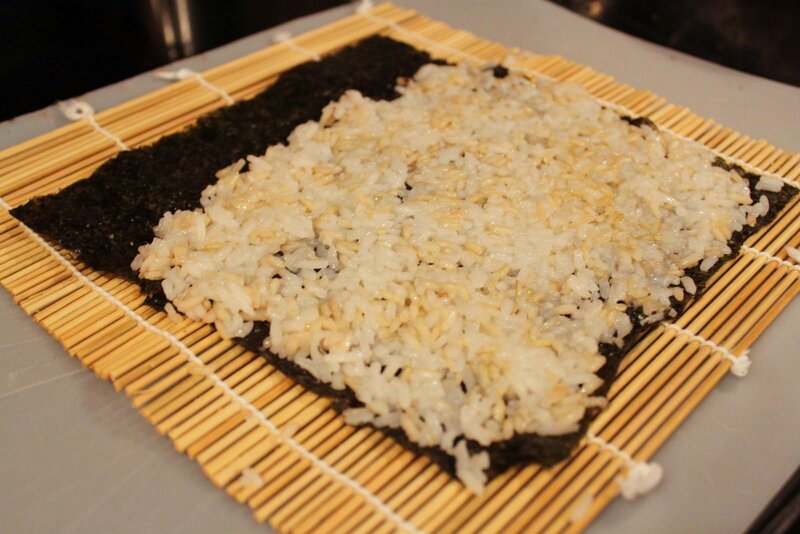 We always have nori on hand, you know, for all of those times that you need a sheet of seaweed in an emergency. Since I didn’t make it to the Japanese grocery store, I decided to try my hand at making the Okonomi Sauce based on this recipe. Based on our memories of the sauce, it was a pretty good substitution. I’m interested in buying some to compare flavors. The Okonomiyaki we ate varied widely between different cities and Okonomiyaki joints. Our experience was that either a restaurant specialized in it, and sold almost nothing except Okonomiyaki and beer or it did not have Okonomiyaki at all. It isn’t exactly like we were able to read the menu though, so this analysis could be way off. 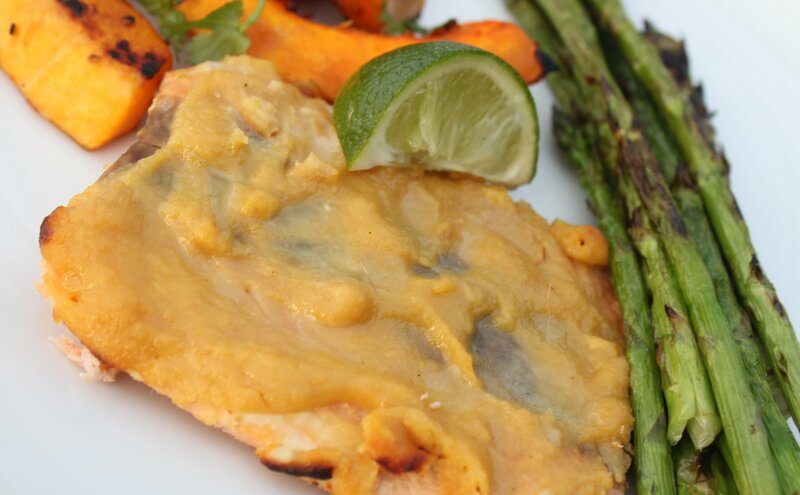 Because of the wide variety of ingredients we saw, I think this dish can be modified pretty dramatically without completely losing its authenticity. The recipe below seems to most closely resemble the variety of Okonomiyaki that we ate in Osaka, while Hiroshima Okonomiyaki tended to have noodles (udon, ramen-looking, or soba) in it. In both cities, we were given the choice to include chicken, beef, pork, various types of seafood and number of eggs. Combine all ingredients in a small saucepan and heat until bubbly. Simmer about 30 seconds more, stirring constantly. Stir in eggs, meat and vegetable ingredients. Pour batter to make single cake about 1/2″ thick. Cook on both sides on medium heat until golden brown (about 5 min). Transfer to serving plate and top with Okonomi Sauce, aonori-ko and/or mayonnaise if desired. Note: I am amazed that I flipped this thing whole. It was huge, this is the biggest skillet that we have!